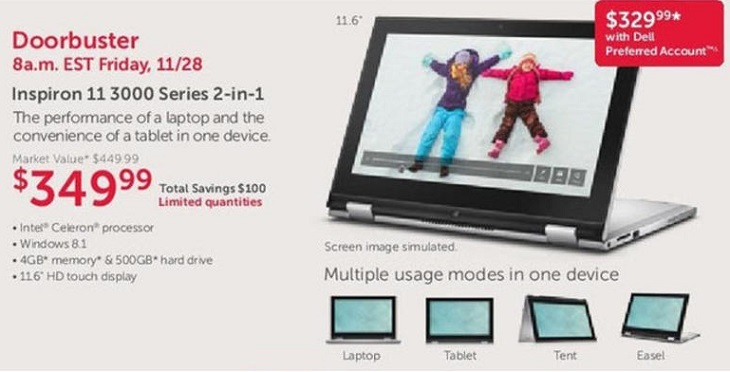 Dell is the first company to publish (or leak) a Black Friday 2014 ad containing Windows laptop and tablets. Among many computer and electronics deals, the PC maker will offer though its official Dell Home & Office store on November 28th a laptop with Windows for $189.99 and a tablet with the same OS for $149.99. 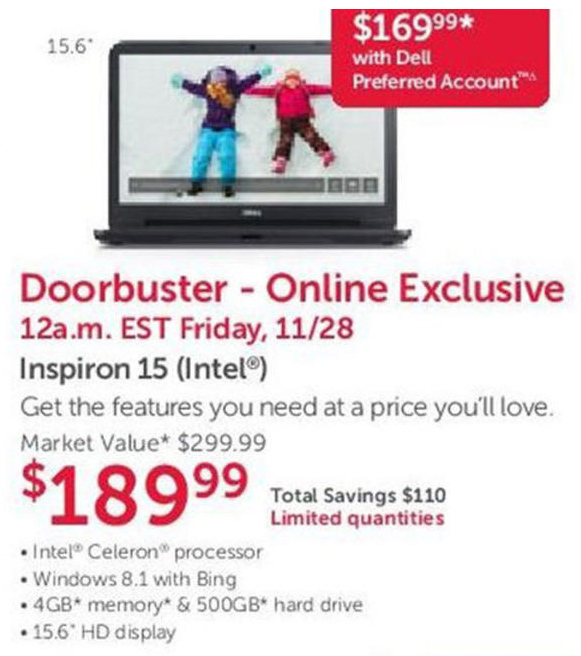 The scanned ad shows on the frontpage an Inspiron 15 “Doorbuster – Online Exclusive” model with a 15.6-inch display. It has an Intel Celeron processor, 4GB of RAM, a 500GB hard drive, and Windows 8 (with Bing), all for $189.99. The exact model name is unknown, but judging from the specs and image, it’s almost certainly the Inspiron 15 3531 you can buy right now for $250. The Celeron in question is the N2830 we reviewed recently. It’s satisfactory fast for the daily home and office chores and some light gaming. The display resolution on this Inspiron 15 is 1366×768 and the laptop has no built-in optical drive nor touchscreen. Overall, not a bad laptop deal, but keep in mind that you can purchase today a very similar system by Toshiba with a DVD burner built-in for only $10 more. The $149.99 doorbuster tablet with Windows is the just released Dell Venue 8 Pro 3000 with an 8-inch 1280×800 display, Intel Atom Z3735G processor, 32GB of internal storage, a potential deal-breaker for many – only 1GB of RAM memory, and a regular price of $199.99. On the positive side, it has IPS wide viewing angle screen technology. 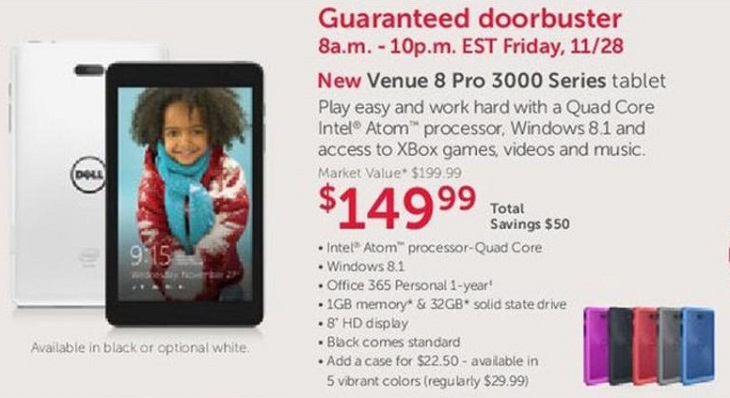 Considering the price and specs, the Black Friday Venue 8 Pro deal is a good one. True, the Nextbook NXW8QC16G with the same screen size, resolution, CPU, and RAM regularly costs $150. 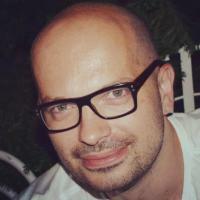 However, it has only 16GB of storage and lacks IPS. By the way, both come with a 1-year subscription for Microsoft Office 365 Personal suite, but almost every Windows tablet on the market includes the same or Office Home and Student 2013. Although not as cheap as the previous two machines, another good deal is the 11.6-inch Dell Inspiron 11 3000 2-in-1 Windows convertible. It will be $349.99 after $50 off. Alongside the 11.6″ 1366-by-768 display mounted on a 360-degree rotating hinge for converting the laptop to tablet and presentation modes, the 11 3000 packs the same N2830 Celeron CPU as the Inspiron 15 and same RAM and HDD sizes – 4GB and 500GB, respectively. Besides these, Dell will sell on Black Friday the Inspiron 15 3000 15.6-inch (1366×768) notebook with a 4th Gen Intel i3 processor, 4GB of RAM memory and a 500GB hard drive for $379.99 and 4th Gen Intel Core i5 processor, 8GB of RAM, and a 1-Terabyte hard drive for $579.99. Claimed savings here are $70 and whooping $420, respectively But the reality is you can find similarly specced systems on the market today at similar prices. As for Dell’s Alienware gaming brand, the catalog disappoints. The only listed notebook is the recently released Alienware 13 for $999.99. It regularly costs that much. It looks like the Alienware page in the catalog is just an ordinary non-Black Friday ad showing off new products, so there’s a hope for a separate Alienware ad. For the latest 2014 Black Friday and Cyber Monday Windows-based laptop / tablet deals, please visit Laptoping’s dedicated page.